Photography workshops and seminars worldwide » Photography workshops. Photography seminars. Education for photographers. Photography courses. Products for photographers. Photography workshops. Photography seminars. Education for photographers. Photography courses. Products for photographers. How can I reserve my place? First of all you must choose the workshop you desire to attend and make double click on it. In this page you will find a shortcut for registration and pay through Paypal. The camera and memory cards are compulsory elements to make the most of this workshop. You can also bring for yourself, targets, card reader, flashes, led lights, laptop, etc. We recommend you dress in layers, because the workshop will take place in different places and the temperature can change. To whom is this workshop directed to? * Photography student interested in starting a business in wedding photography. * Photographers who want to expand in the wedding market. * Wedding photographers who wants to increase their business. * Wedding photographers who wish to wide their creative capacities. Is accommodation and food included? No, you are free to bring your beverages and snacks. Later, nearby sites will be provided, to provide meals and a list of hotels near the workshop. Once reserved your place is blocked for you, so we can´t refund because of limited number of members and available seating. Once a seat is reserved, it’s not available for anyone else. But you are the owner of the place and you can give in to a third person (previous consultation and approval). Where will the workshop be located? The information about the location of the workshop and nearby hotels will be delivered later, we are now working on that. You will receive and email with all information when available. Can I use any image obtained in the workshop? The student have the right to use any image obtained within the workshop for a private use on webs, blogs or social networks, as long as it makes reference to the workshop, but these images cannot be used in photograph competitions. The model´s contract will not be provided to the students. In which language will the workshop be imparted? 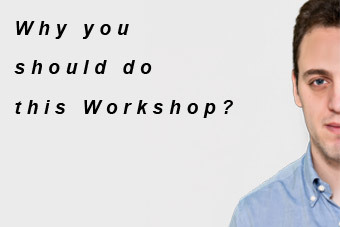 Why you should do this Workshop? 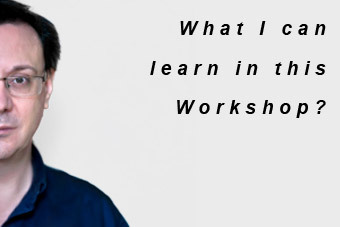 What I can learn in this Workshop?